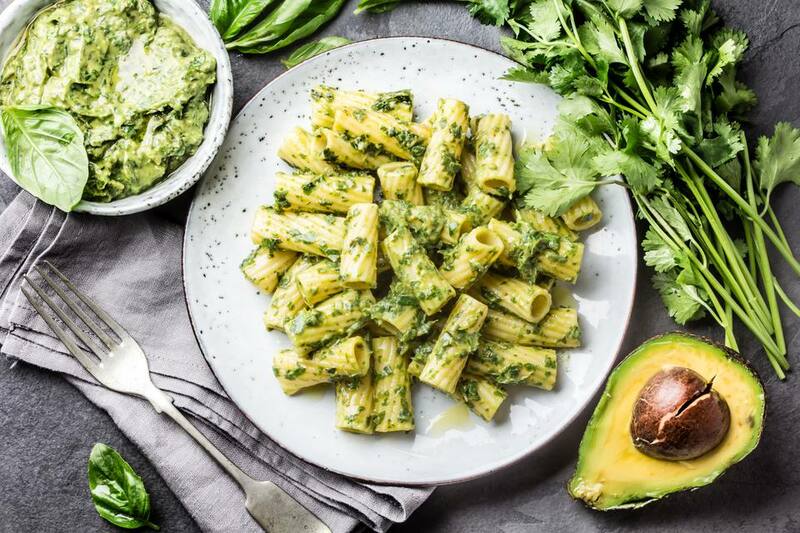 Pesto and avocado go surprisingly well together, which you'll soon find out if you try this avocado pesto pasta recipe. Need it to be vegan? Use nutritional yeast instead of Parmesan cheese to make the pesto or just sub in your own favorite vegan pesto recipe. Need it to be gluten-free? Use gluten-free pasta and you're good to go, since all of the other ingredients, including Parmesan cheese, avocado, basil, and garlic are all gluten-free. Like with most vegetarian recipes, it is recommended that you use either kosher salt or sea salt in this dish, as it really does make a big taste difference. First, prepare your pesto. You can also skimp and just use a store-bought jar of pesto, but it's so much cheaper, fresher, and tastier to make your own! To prepare the pesto, place the pine nuts or walnuts, basil, garlic, sea salt or kosher salt and Parmesan cheese in a blender or food processor and pulse together a few times. Slowly add the olive oil and blend until you have a nice, smooth consistency. You may need to add a little bit more or less olive oil to get the perfect texture. Next, cook the pasta according to the package instructions, or however you like to cook your pasta. Drain well. Next, combine it all. Toss the prepared pasta with your prepared pesto until well combined, then gently toss together with the diced avocado, being careful not to break up the avocado. Finally, give it another little sprinkle of sea salt or kosher salt and fresh ground black pepper to serve.